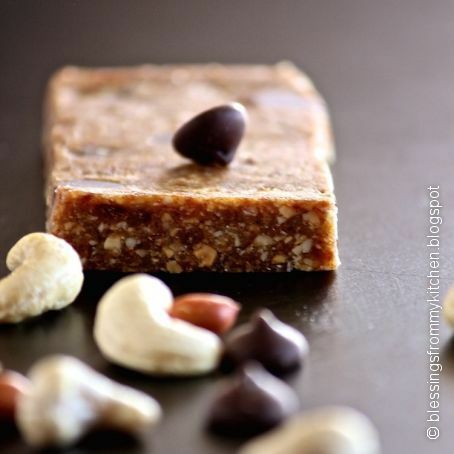 A healthy five ingredient bar that is delicious. Place peanuts and salt into the bowl of food processor. Pulse to form chunks. Add cashew, pulse 2-3 times, till all nuts are broken and mixture is still chunky. Add the dates and process till dough forms. Transfer contents to a large bowl. Using wooden spoon or spatula, mix in coconut, chocolate chips. Spread mixture between two large parchment sheets. Store in refrigerator for 1 hour. Can keep chilled for upto a week. If you're using smaller dates, you'd probably have to add more, until mixture is bound properly. Dough might be sticky, it would be best to smooth/shape using parchment paper, even wax paper- though I believe the latter might stick. You can swap more/less cashews to peanuts; whatever/ wherever your pantry/tastebuds allow.